Gratin is basically a French dish cooked/baked in a shallow dish with ingredients covered with cheese. Vegetable Au Gratin is the most common recipe prepared in Au Gratin form. Fish, seafood, Chicken can also be prepared in Au gratin form. I have used pasta (macaroni) in the regular vegetable Au gratin to make it a full meal with salad. It is very simple and easy recipe to try. It is also a great way to make your kids eat all the veggies without any hassle. It is basically cooked in white sauce and cheese. 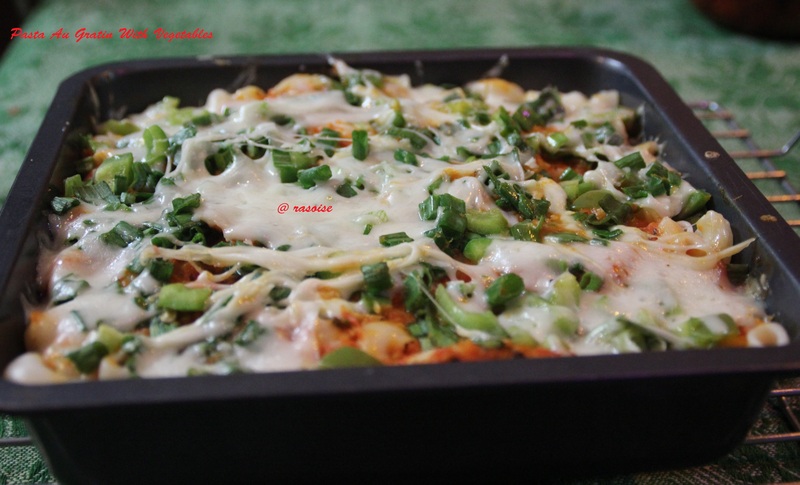 I have tried the recipe with a little twist of red sauce and cheese to make it more healthier. White sauce uses maida (All purpose flour) which we will not be using in this version of the recipe. Also,this recipe can taste bland at times, so I have indian-ised it with few of our spices and flavors. Tomatoes – 10 big nos. Take the tomatoes in a big sauce pan. Cut them from the bottom in a cross. Add water and boil them. After boiling run them under tap water, so that the skin starts to come off. Peel off the skin from all the tomatoes. Grind half the tomatoes and chop the other half. Take the sauce pan, add oil. Add garlic and chopped tomatoes. Cook them for 2 mins on high flame. Add pureed tomatoes, salt ,sugar and cook till the water starts to dry up. Please note we do not have to dry up the water completely. Also, keep stirring. Add Basil and oregano and turn off the gas. Cover the pan and let it cool under steam. Melt the butter on a low heat in a saucepan. Add all the veggies and stir them. Then add salt, pepper powder, black pepper and cumin powder. Let it cook till the vegetables are half cooked. Add cream and milk and cook till oil separates. Take a pan, add oil and water. Bring it to boil. Then add salt and macaroni. Keep stirring and boil till macaroni softens. Drain the macaroni and transfer to a big bowl. Preheat the oven at 230 degree C.
Take the Casserole or bake tray. Apply butter to all the sides and spread vegetables, prepared in step 2, evenly in the tray. Add a layer of the mayonnaise now on top of the vegetables. Spread boiled macaroni evenly as our third layer, totally covering vegetables and mayonnaise. Now spread tomato sauce, prepared in step 1, evenly over the entire sheet of macaroni. Finish the layering with grated cheese and chopped greens of spring onion. Cover the pan with aluminum foil and bake for 20-25 minutes. Then remove the pan from the oven and remove the foil. Bake again for 5-7 minutes, until you get a light golden brown top layer. And it is ready. Enjoy and savor! You can use the vegetables easily available at your home or of your choice. Vegetables other than the ones used can be; peas, broccoli, potato, Corn or Eggplant. If you do not want to use pasta in your recipe, you can simply follow step 1, 2 and 4 for Vegetable Au Gratin. Tomato sauce prepared here is easily available in market as Pizza Sauce. If you want to save on time, you can buy from market. Though homemade is healthy with no preservatives and tastes better. You can also see our other baking recipe of Eggless Dryfruit cake and our recipes in Chinese cuisine Veg Fried Rice And Manchurian Gravy. 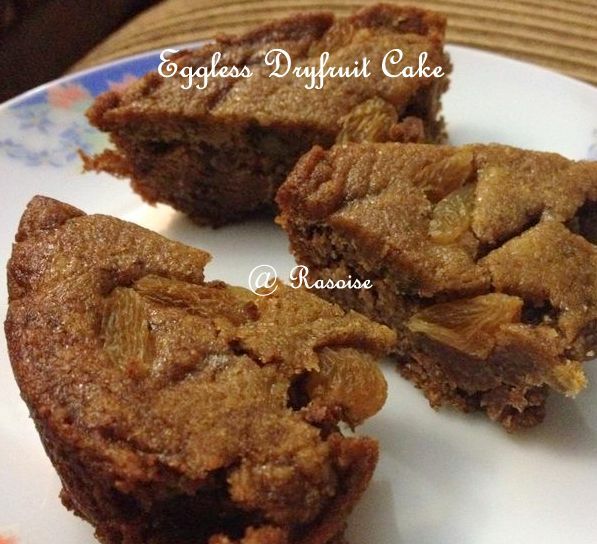 This Eggless Dry fruit Cake is very close to my heart……..Today I baked my first cake!!!! It turned out really well, yummy and delicious. I had never baked before. My mom used to make vanilla cake, chocolate cake during our childhood days. 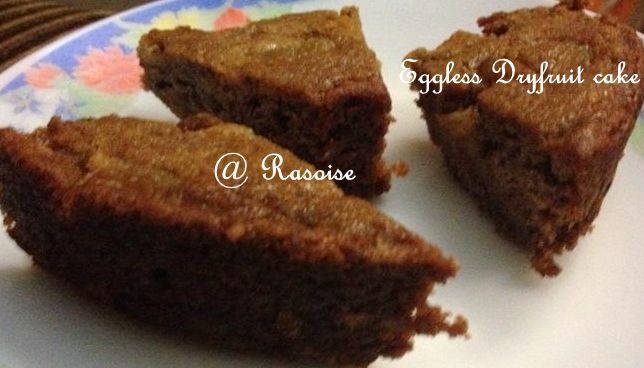 This version of cake is really healthy as it contains lots of dry fruits and dates, less of sugar (as compared to other cakes), contains milk and butter. So because the ingredients are healthy…the final product is healthy…..
Bring milk to a boil with dates. Allow it to cool at room temperature. In the meantime, take a big bowl and sieve all purpose flour and baking powder in it. Now grind milk and dates along with sugar. Grind it to a fine paste. Add this paste to all purpose flour and butter mixture. Add dry fruits (coarsely crushed) to the mixture. Grease the baking tray with oil. Transfer the batter to the baking tray. Now bake the cake in convention on 160C for 35 to 40 minutes. You can check after twenty minutes. Mine was done in 35 minutes. If you like the recipe, leave a comment ! !